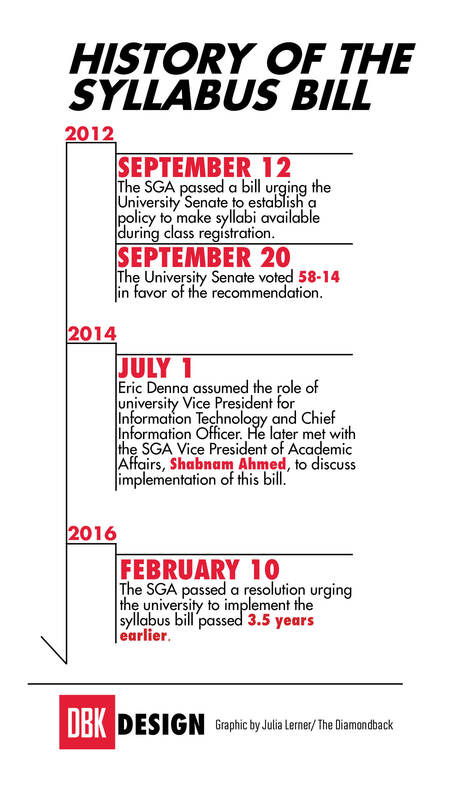 The SGA passed a resolution this past Wednesday urging the University of Maryland to implement a syllabus bill that the University Senate approved in 2012. The vote was 21-0, with no abstentions. The original senate vote of 58-14 approved a policy stating that syllabi should be available online at the time of class registration, yet there is still no centralized place for students to view syllabi while registering for classes. With more than 70 sections for some classes, such as ENGL101: Academic Writing, the registration process can be a gamble. A syllabus, however, could give students a better idea of the workload or expectations of specific professors and help them decide which to choose. “The only real thing we can do at this point is to go to these people, show them this is how we think and feel about it and work with them towards a solution,” said Shabnam Ahmed, academic affairs vice president and a junior individual studies major focusing on global public health and development. After the senate approved the policy in September 2012, it should have been implemented, Ahmed said. Whereas the ELMS system is an optional tool for faculty and staff members, the syllabus policy requires professors to provide a syllabus for students during registration. However, enforcing the policy among faculty members is a challenge, she said. Ahmed met with Eric Denna, this university’s vice president of information technology and chief information officer, on Friday to discuss how the Division of Information Technology can support the bill’s implementation by examining possible systems that could display syllabi at the time of registration. Denna began working as CIO in July 2014 — well after the bill was passed. Therefore, the SGA Academic Affairs Committee voted 9-0 with two abstentions Feb. 7 in favor of a resolution to revive the bill and bring it to the university’s attention. Despite the bill’s resurrection within this university’s legislature and the efforts of DIT, syllabi will not be available by the next registration cycle, Bederson said. “The first students register for fall in a month or so, so the answer is absolutely not. There’s no chance it will be ready in a month,” he said. Staff writer Lexie Schapitl contributed to this report.